Tannoy celebrates 90 years with limited edition Gold Reference speaker | What Hi-Fi? Tannoy’s 90th birthday may have been overshadowed by news of the company’s Scottish manufacturing plant being under threat of closure, but that hasn’t stopped the firm producing a limited edition Gold Reference GRF 90 loudspeaker, with just 90 pairs being made. The GRF 90 is part of Tannoy’s Prestige GR range of loudspeakers, first unveiled at the Munich High End Show in 2013. The range marries the handbuilt wooden cabinets of the Prestige range and updated versions of Tannoy’s Dual Concentric Drivers. The GRF 90 is named in honour of Tannoy’s founder, Guy R Fountain, who started the world famous company in London in 1926. The 12in Dual Concentric Driver with Tannoy’s signature PepperPot WaveGuide, Alnico motor system and HF compression driver makes an appearance once again. 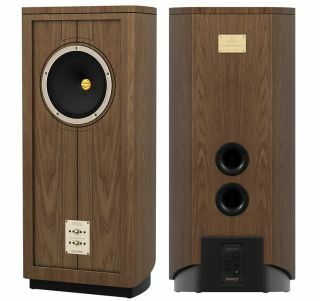 Tannoy says it’s able to produce a “superbly dynamic presentation with fast, accurate bass and a fluid open midrange”. MORE: Tannoy: after 90 years, what does the future hold? It’s all housed within a bespoke birch plywood cabinet which has been heavily braced, and features a twin rear port designed to “reduce low frequency turbulence”. The Tannoy Gold Reference GRF 90 will be limited to just 90 pairs, pricing is on application, but don’t expect them to be cheap. This latest product announcement comes at a troubled time for the company, which is planning to close its factory in Coatbridge, Scotland with the loss of 70 jobs after owner Music Group decided to move most of its production to a new facility in Zhongshan, China. Peter Sommer, who was appointed as senior vice-president Lifestyle & Home at Tannoy earlier this year, is due to leave the company in October. Music Group, based in the Philippines, but with offices around the world, acquired Tannoy, a name synonymous with loudspeakers, in April 2015 from its former owner TC Group.